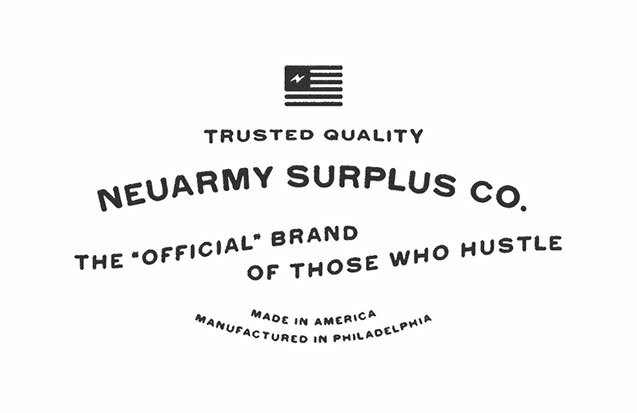 Neuarmy Surplus Co. is a Philadelphia-based outpost supplying Limited Issue & Standard Issue shirts, Hand-made Field Pouches, Hand-painted Wood Signage, Linocut Prints, Large Format Prints, and other Quality Goods. Originally established in 2002, NSCo. is rooted in thoughtful design, quality craftsmanship, and hustle. A behind the scenes look at the process of hand-painting wood signage. White wash, projection, sketches, painting, and detailed shots. We take time to source our surplus based on overall quality and aesthetic. Here's a few things to know about these salvaged materials. An in-depth look at the process of creating our Limited Issue Shirts. Stamping, packaging, detail images, and process shots.